Low cost cellular surveying equipment is becoming more important. As IoT and other data applications using cellular connectivity need to determine the signal strength and also the optimum locations for antennas, etc, small portable equipment is very useful. 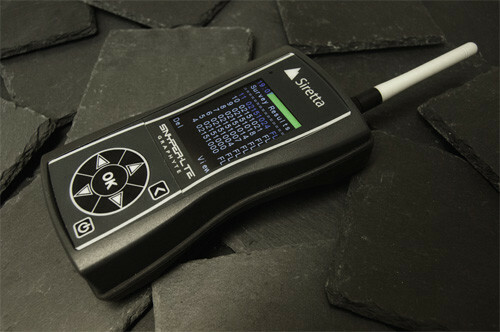 Meeting this need and many others, Siretta, a British designer and manufacturer of wireless connectivity and test products, has launched its SNYPER-LTE Graphyte cellular analyser. The Siretta SNYPER-LTE Graphite analyser is able to provide a very useful insight into the cellular signal within an area for use by installation engineers, research and development, utility companies, cellular network providers and very many others. The SNYPER LTE Graphite also has a feature known as livescan that enables the engineer to monitor the signal strength of a particular operator so that the optimum location and direction can be determined when installing an antenna for an M2M or IoT application. In circumstances where engineers have a variety of antennas to they can install, the SNYPER LTE Graphite provides the capability for them to select the most reliable and cost effective solution. By installing antennas that are not over-specified for a given installation, significant costs can be saved whilst ensuring reliable operation. The SNYPER-LTE Graphyte helps installation engineers and project managers to select the most reliable network for each location and to carry out all post-deployment analysis. Measuring cellular signal strengths over lengthy periods no longer requires anyone to be present, thanks to this sophisticated yet easy-to-use new signal analyser that can be left unattended after its initial set-up. The SNYPER-LTE Graphyte measures signal strength for 2G, 3G and LTE networks, either individually or simultaneously. Another key feature of the SNYPER-LTE Graphyte is that it does not require a SIM to carry out cellular surveys, this being in difference to some of the existing SNYPER Family. This facility is particularly useful because it means that the operation of the SNYPER-LTE is not limited by the SIM that is available. The SNYPER-LTE Graphite is able to undertake a variety of datalogging activities. Survey results are saved automatically and at the end of the surveying period an overview is instantly available. Detailed and time-stamped logs of cellular signal strengths can be downloaded as required via the device’s built-in USB port for full analysis in standard spreadsheet or graphical HTML format. Depending on the user’s requirements, the multi-survey results (which are available in English, French, German, Italian, Spanish) can then be broken down by base station, mobile network operator, MNO and network level. Selection of the most suitable MNO/MNO’s for a given location can be assisted through viewing information on the presence of each base-station, during the multiple surveying period, as well as via an MNO summary table showing the number of operator base-stations at defined signal level breaks. The SNYPER-LTE Graphyte simplifies survey logging though easy-to-follow menus that enable users to set their survey criteria, including number of surveys and time intervals between them, with pre-set configurations. Costing less than some mobile phones, whilst having a considerable level of performance, makes the SNYPER-LTE Graphyte analyser a really effective instrument for a huge number of applications.